​Our newsletter is published at the beginning of the month. Here are your headlines for the month of January. Submit your answer every month to info@solomonexamprep.com to be entered to win a $10 Starbucks gift card. This month's winner is Abe B. New Solomon Exam Prep Study Guides! 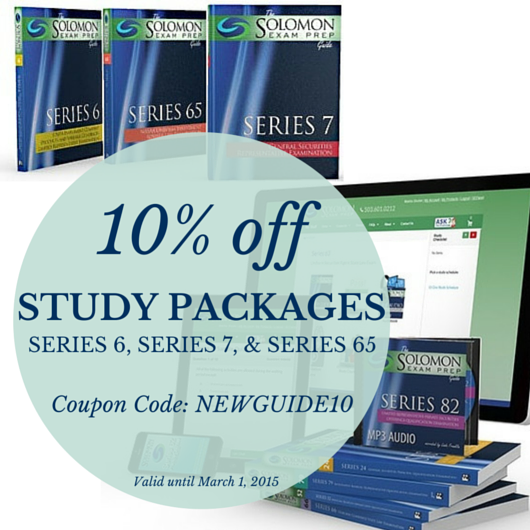 To promote these new Study Guides we are offering an additional 10% discount on all Series 6, Series 7, and Series 65 Study Packages until March 1, 2015. Just use coupon code NEWGUIDE10 at checkout to claim these savings.